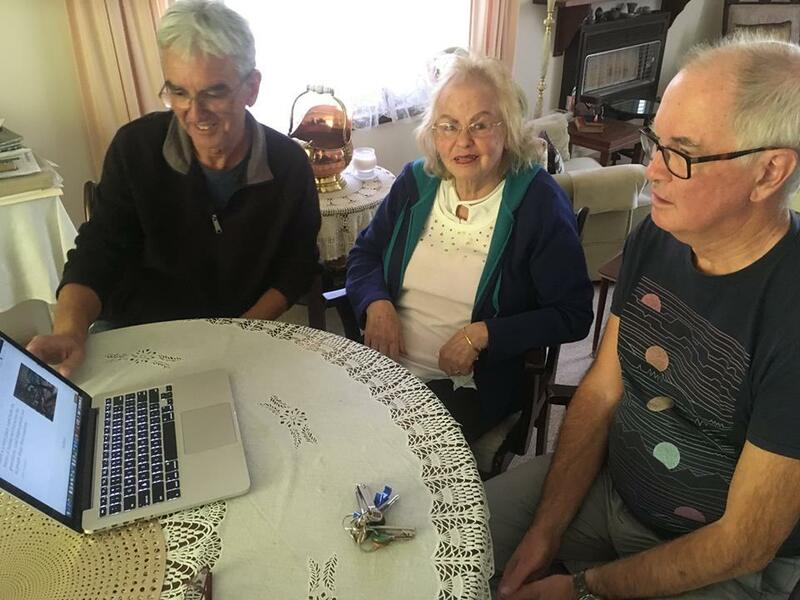 David and John showing Noelene White, daughter of Carrolup schoolteacher Noel White, The Carrolup Story , to which she had contributed so much. We launched the website three days later, on Noelene's 85th birthday. This must be the tenth website I’ve developed for my work over the past 18 years, most of which have been done with web developer Ash Whitney, a close friend from Neath in South Wales (UK). I’m often asked how long does it take to build a website? That question is not easy to answer. A concept for a website can rattle around in your head for a long time before you start putting pen to paper, and then clicking on the keyboard to start development. Once the website is launched you can be continuing to develop for a long period afterwards—in some cases, when does development stop? The idea of a Carrolup website has been rattling around in my head since I started working on a Carrolup project a couple of years ago. However, my focus was on conducting research and then writing a book about the Aboriginal child artists of Carrolup, a book that will appear sometime early in 2019 in eBook format. Eighteen months ago, I met up with John Stanton and after many discussions we agreed to work together on a Carrolup project, a decision for which we are now both very grateful. We agreed that this had to be a multifaceted project, with book, website, feature-length documentary film and community engagement initiative. An ambitious plan, particularly as we were starting with no funding at all. However, we wanted to get the Story to as many people as possible and different forms of media would help us realise that aim. I wasn’t keen on building a website on my own, as I had done with Sharing Culture using the iPage platform. There are just too many niggles that can arise and need sorting out. And problems generally occur at the most impractical of times. So, we decided to hire my old friend Ash Whitney. We provided Ash with an initial concept and draft website structure—which I’d thought a lot about over time—and asked Ash to give us a quote. It wasn’t long before we decided to proceed. John and I had worked out the concept—a Storytelling, Education and Healing online resource—and purchased the domain name www.carrolup.info. We decided upon the approach we would adopt and the various parts of the website to be developed. We would both blog regularly, telling Stories from before, during and after the Aboriginal child artists were at Carrolup. We would interview people and help them tell their Stories. We would have a Story section which summarised the core Carrolup Story, and Galleries that showcased the art, photographs and memorabilia. We both knew that our initiative had to be about facilitating the healing of trauma, so we had to set up a Healing section. We intended to shoot film, initially by ourselves, later with Simon Ackerman, an award-winning Cinematographer we both knew. We discussed our approach and proposed website structure with Ash and he made some important initial suggestions. He then helped us chose a theme, a basic ‘look’ for the website which he would then work up. We were thrilled with the initial Home Page he showed us. It was just what we wanted. John and I then split up the variety of tasks we had to complete. John has filmed a lot of material since the mid-1980s when he was involved in a collaborative Carrolup Project with the Marribank Community. He needed to work through all this film, digitising the older material, making backups, watching the film and choosing sections to be edited, making a record of what we had, and then editing short clips pieces to be used on the website. He was also arranging for all the film to be stored at the Berndt Museum, who we had asked to be a partner on this initiative. You can see some of the short film clips that John edited on our YouTube channel. As John was doing all this, I was busy working with Ash, preparing written content for the website, selecting images (artworks, photos, documents, etc), deciding with Ash how certain parts of the website would look and be used, and continually checking things. Every now and again, John would check pages of content as well. He also started to think about his first blogs. We started to choreograph the first part of our Story of Stories. What should be the first Blog posting after my initial Welcome? We felt that it needed to be part of John’s journey, a Story that best linked the Past with the Present. The decision was easy—John had to start with the journey that Ezzard Flowers, Athol Farmer and he took to Colgate University in the US in 2005. Just before the three men walked into the room and saw the ‘missing’ collection of Carrolup art for the first time. Meanwhile, Ash and I were ploughing on with our tasks. There is a myriad of things to think about in web development, not least the future user experience. How friendly and easy to use will the website be for your audience? And remember, what you see on a computer screen is not what you see on an iPad (or other tablet) screen or on a phone. Each experience had to be considered. And we had to make sure that the initial content was interesting, stimulating and error-free. And all those darn legends to be written for the artworks, photos and memorabilia. Along the way, I was learning to use the WordPress system to run the website… and John was working on more film, doing more checking that everything was okay. We were getting very tired… and maybe a little ‘crazy’. It’s so good we had Skype, so that we could talk directly with Ash. He would sometimes talk with us for 60 – 90 minutes in our morning (for him, the discussion might begin at 01.00). And sometimes I was talking to him in the middle of our night. However, the day came when everything was ready… well almost everything. We were ready to launch….